Leading Manufacturer of gram atex certified bioplus low temperature freezers, rockymax - rocking shaker, gram atex gmp glp certified laboratory refrigerators & freezers and gram atex biomidi freezers from Chennai. The BioPlus 500 is available as a refrigerator ER (-2°C/+20°C) or freezer RF (-25°C/-5°C), and comes with stainless steel interior and white or stainless steel exterior. Resembling the regular 600W and 660W, the EF is a low temperature cabinet able to run at -35°C. 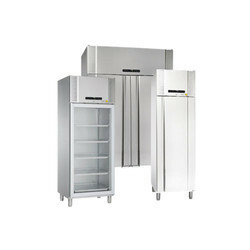 The "EF" (extended freezer) model range comes standard with a handle for secure closing, and inner doors for maximum cold-retention during door openings. As with the regular ER and RF "W" models, the overview one gets from having a wider cabinet makes for efficient in and output. Like all the other BioPlus models, the EF600W and EF660W models can cope with anything from general purpose to mission-critical storage scenarios. 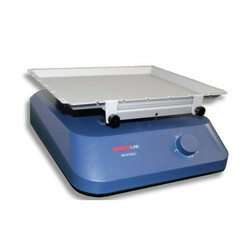 The BioPlus EF600W and EF660W are solely available as the -35°C/-5°C model, and comes with stainless steel interior and white or stainless steel exterior. Used for staining and destaining gels, hybridization procedures, haematology and blotting techniques. It has a variable speed, powerful DC motor to provide gentle rocking motion. All the moving parts are fitted with bearings for quiet, trouble-free and smooth operation. The most advanced Gel Rocker in the market today. The BioMidi cabinet is designed to meet the majority of biomaterial refrigeration and freezer requirements, with very few limitations. The specifications include the major features from our top–of–the–range BioPlus model, making it the ideal choice when the ability to maintain stable temperatures. The BioMidi range is equipped to handle almost any challenge, despite its cost-effective nature. The BioMidi range of products excels with functional and clever design enabling ergonomic access to the storage space. 425 litre or 625 litre cabinets are available, with temperature ranges spanning from -40°C to +20°C. The BioMidi 625 is available as a refrigerator RR (+2°C/+20°C) or freezer RF (-25°C/-5°C), and comes in stainless/aluminium or all stainless interior and white, stainless/aluminium or all stainless exterior. Resembling the regular 425, the EF is a low temperature freezer capable of running at -40°C. The "EF" (extended freezer) model range comes standard with a handle for secure closing, and inner doors for maximum cold retention during door openings. Despite this different operating range, the EF425 retains the benefits inherent to the 425 cabinet, relatively small size, ergonomics and performance.